Under the leadership of Comandante Fidel Castro and his comrades, Cuba has played an outsized role in supporting revolutionary and progressive movements around the world, far greater than might be expected from a relatively small country. Some of Revolutionary Cuba’s actions are well-known, such as the its role in defeating the CIA/South African attempt to conquer Angola in the 1970s and 80s. The decisive Battle of Cuito Cuanavale was not only a victory for the Angolan people, it was also a key factor in the downfall of the apartheid regime in South Africa itself. Cuba’s solidarity with numerous movements in Latin America is widely documented. Less known, is the long history of Cuba’s solidarity with the Palestinian and other struggles in the Middle East and North Africa, a history that began only months after the 1959 revolution. A few months after the triumph, Raul Castro and Che Guevara visited Cairo, making contact with African liberation movements based there, and also visited Gaza, then under Egyptian administration, expressing solidarity with the Palestinian cause. Cuba saluted the formation of the Palestine Liberation Organization in 1964, and established ties with the FATAH movement the following year. 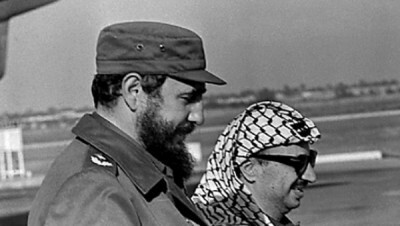 A close alliance was developed between Cuba and the leftist government of Syria in the late 1960s, and at the time both supported FATAH after it became the dominant force in the PLO. Cuba provided political, educational and military support to FATAH, as well as the Popular Front for the Liberation of Palestine (PFLP) and the Democratic Front (DFLP), the second and third largest organizations in the PLO. The 1966 Havana-based Tricontinental Conference called for uniting the countries of Asia, Africa and Latin America in a united struggle against “colonialism, neo-colonialism and imperialism.” In his closing speech Fidel spoke of “the warm support of the conference” for the Palestinian people. Following the October 1973 war, Cuba broke diplomatic relations with Israel. The next year, Yasir Arafat, Chairman of the PLO was received as a head of state when he visited Havana, and later an Embassy of Palestine was established in Cuba. In 1975, Cuba was one of the sponsors of UN Resolution 3379 that branded Zionism “a form of racism and racial discrimination,” and passed by a vote of 97-35-32. Following the 1978 Camp David Accord, which split Egypt away from the other Arab states and dealt a severe blow to the Palestinians, Cuba supported the “Steadfastness Front” made up of Syria, Libya, Algeria and the People’s Democratic Republic of Yemen (South Yemen). Camp David paved the way for Israel’s murderous assault on Lebanon and the Palestinian refugee camps, which left over 30,000 people dead, and was condemned by the Cuban government. Cuba gave strong support to the mass Palestinian Intifada that began in late 1987.